The Patient Care Centre are Royal Jubilee Hospital is an elder-friendly environment, featuring single-bed rooms for comfort and privacy, as well as landscaped outdoor spaces for patients and family to enjoy. Other features include sound-minimizing material on the floors, ceilings and walls, as well as inter-hospital communication devices that avoid background noises, improving the patients’ experience and allowing necessary relaxation. Evidence-based design practices help to create healing environments that encourage the highest quality of care, advance safety standards and increase overall effectiveness and efficiency. For example, wall color and patterns, healing art themes and consideration of patient views from room windows all create a calming environment for caregivers and cared-for alike. The overall design is ergonomic in its approach, reducing patient stress and thereby improving wellness and recovery rates. 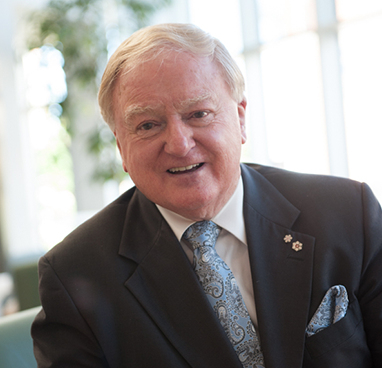 Business and community leader Mel Cooper did not anticipate his stay at the Patient Care Centre. Read his story. I’m Mel Cooper. I’m 80 years old, and up until July 1st of 2013 I had never needed hospital care. I wasn’t expecting to need it that day either. I was in the C-FAX broadcast studios as part of a special broadcast honouring Joe Easingwood. I’ve spent a lifetime in radio studios. But that day was different. I breathed with difficulty during that three-hour broadcast. When it concluded, I asked the producer, “Did my voice sound laboured? I’m having breathing problems.” He replied, “No.” But when I walked down the stairs, I knew something was wrong. So did my wife when I phoned her. Carmela called 911. Before I knew it I was in an ambulance on the way to Emergency at Royal Jubilee Hospital. Eventually I was admitted to a warm and comfortable room on the eighth floor of the new Patient Care centre. I was diagnosed with a massive blood clot that was pushing on my lung, seriously hampering my ability to breathe. During my stay in the Patient Care Centre, I witnessed why the word ‘care’ was aptly part of the new Centre’s name. I also learned I was a lucky man to get the critical diagnosis and treatment that saved my life. I love my life and want to live it to the fullest with my family and friends in a community I care for deeply. I breathe easier now knowing that I’m getting a chance to do that. That July, my life could have ended in a heartbeat. If I hadn’t received the care I needed the moment I needed it, I most likely wouldn’t be here to write this letter to you. That’s what I think about now — how grateful I am that we have this state-of-the-art, healing hospital and a Foundation that supports our doctors and nurses in doing their finest work. The Victoria Hospitals Foundation is asking you to help purchase high quality equipment to make sure our hospitals are fully equipped for you, your neighbours, friends and family, and for everyone living across our region. With all of us pulling together, I know we can do it! I experienced first-hand the difference leading-edge equipment made to recovery and comfort. Please think of those patients who need us most and give generously from your heart.